As matched bettors, many of us place multiple bets a day across various bookmakers and casinos as well as betting exchanges with the vast majority of these bets being placed and settled without any issues. However, on occasion, problems do unfortunately arise and it can be daunting, unnerving and confusing for an individual on how to resolve disputes against operators. Whether the issues relate to withdrawals, unpaid winnings, uncredited free bets or bonuses or an account closure, there is help you can receive to resolve disputes which we will be detailing in this article. What are the causes of a bookmaker/casino dispute? There are various reasons for a dispute to arise between an customer and an operator. We’ve listed some of the most common dispute reasons below. It’s a rare occurrence when a bookmaker or casino won’t approve your withdrawal but there is usually a reason for it. The most common reason for a bookmaker to hold your funds is when you haven’t provided the required ID documents. Many bookmakers ask for ID documents to verify you are who you say you are and it’s always a good idea to have a copy of the most commonly asked for documents at hand. These are generally a copy of your passport, recent utility bill or a copy of the card you used to make a deposit (you can cover up the majority of the numbers). Another reason why you may not be able to withdraw your funds is if you have not adhered to the terms and conditions. For example, you may have not met the wagering requirements of a bonus or you have claimed a bonus but have not wagered your deposit. Terms and conditions of bookmaker offers can be very long and it’s important to understand them before opting in and claiming any promotions. The significant terms should be clearly displayed by a bookmaker or casino but it’s always best to read through the T&C’s to make sure that you’re clear on what you’re accepting. Not being credited with a free bet or bonus is usually not a reason to open a dispute with an operator. The majority of the time this sort of situation can be resolved by contacting the support team and explaining the situation. However, you may find that a bookmaker or casino have ‘gubbed’ you without any notification. Being ‘gubbed’ refers to when the bookmaker decides you are unable to participate in promotions or receive any free bets or bonuses and is, unfortunately, a common occurrence for people who do matched betting. If this happens you will usually be notified via email but if you are not notified and have placed bets and not received the associated free bets or bonuses, you may have a case. If you have had your account closed and are unable to access your funds, you may wish to raise a dispute with the operator. If you have been acting lawfully, then you should be able to access your funds at all times. The operator should be able to give you a reason as to why your account was closed and if so, you should be able to determine whether or not it is justified. If you believe that it isn’t then you may wish to take the matter further. As mentioned above, there is help you can get to resolve disputes with operators. However, in a lot of cases, disputes can be resolved directly between yourself and the bookmaker. Below are some advised steps you should take if you have a pending dispute. 1. What is the dispute? It’s easy to think that you are right and the bookmaker is wrong but take a step back and make sure that this is the case before proceeding with any complaints. If you haven’t received a free bet, have you adhered to the T&C’s? Maybe you placed your qualifying bet on an ineligible market or below the minimum odds. If the bookmaker has refused a withdrawal, what reason did they give? Check the T&C’s and make sure that you have done everything right. If you feel you have acted appropriately according to the operators’ terms, you may wish to challenge the decision. If you feel you have a valid argument, discuss this with the bookmaker or casino directly. Explain your concerns and request a response. It’s important in this step to be professional and polite and not to get overly aggressive despite you believing you are in the right. A lot of the time you are able to resolve the situation with a simple discussion via email, live chat or over the phone. If you’ve spoken to the bookmaker or casino and are unable to resolve the issue, you may wish to esculate the dispute using an ADR. These are third-party services who act as an impartial middle-man and will review your case and decide on a verdict. There are a few different ADR services such as IBAS and eCOGRA who can help in these situations and will require details of the situation along personal details to proceed with the case. ADR services are free to use and have resolved many issues for players. If you are unable to resolve the issue with the operator directly, you may have no other choice than to escalate the complaint with a third-party mediator. There are a few to choose from but before doing so, make sure you are prepared by having all relevant details at hand to submit your case. Most impartial adjudication services will require you to attempt to resolve the issue with the operator directly before submitting a case so make sure you explore that channel first. 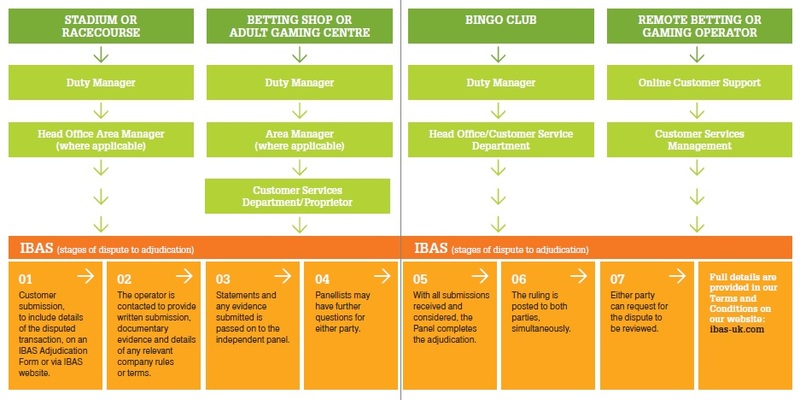 IBAS is one of the main impartial adjudication services and help resolve a lot of disputes between customers and bookmaker, casino, bingo and lottery sites. IBAS stands for ‘Independant Betting Adjudication Service’. Below is a flow diagram of how a complaint is dealt with through IBAS. You can see that the first step is to attempt to resolve the situation with the operator directly before submitting a case. If you do submit a case to IBAS, they will then review and contact the operator requesting a response. Initially, you will be asked for a detailed report of the situation. This may include what the dispute is, any events which occurred leading up to the dispute eg. deposits, gameplay, opting into promotions etc. It is important to have all of these details noted down for when you submit your claim along with dates and times of deposits, gameplay and when you have contacted and received replies from the operator. If your account has been locked by the operator and you are unable to gain access to this information, mention this in your submission. You can use bank statements to validate deposit amounts and date of deposits. Once you feel you have included as much information as possible, submit your dispute form and wait for a reply. You may be asked for further information or proof of claims depending on the response given to IBAS from the operator. eCogra is another independent service which helps resolve disputes between players and operators. Start by searching for the operator in question on their SRS dispute form. There are a lot of bookmakers & casinos listed but the operator you are having issues with must be on their list in order to submit a case. Before submitting the form, make sure a minimum of two weeks have passed since the problem began and that all reasonable attempts have been made to negotiate a solution directly. When submitting the dispute form you’ll be asked for personal details along with a description of the dispute. Be as detailed as possible and avoid any abbusive or aggressive wording towards the operator. Just state the situation with the facts and let eCogra review your submission. After submitting your dispute, eCogra will contact you within 2 days and attempt to update you on your case at least every other week. It may be that IBAS and eCogra are unable to assist you with your dispute in which case you may look to seek help elsewhere. Some popular alternatives are listed below. Ask Gamblers – You can submit a complaint with Ask Gamblers and one of their team will attempt to contact the operator directly to help resolve the situation. To date, they have helped over 8,000 players return over $19,000,000 from casinos through their service. The Pogg – Providing a similar service to Ask Gamblers, The Pogg help players resolve disputes with online casino operators. They have helped retrieve almost $2 million for players over thousands of submitted complaints. Casinomeister – Offering a free service to help resolve disputes between players and casinos. Casinomeister will look into a complaint about any online casino which makes it an attractive option should the casino in question not be listed with other dispute resolution services. Sportsbook Review – Focussing on helping players resolve disputes with Sportsbooks rather than Casinos, SportsBookReview.com may be able to assist with your complaint. GamblingGrumbles – Online since 1998, GamblingGrumbles is an online gambling mediation service for complaints with casinos. How long does it take to resolve a dispute? Resolving a dispute can sometimes be a long process. It really depends on the individual case but some can take up to a year to resolve. However, if you feel that it is the operator who is in the wrong, it is worth proceeding with the dispute. Not only should you see a return at the end of it but you may also be preventing the situation from happening again to another player. Hopefully, your dispute will be settled quickly and without hassle. How successful are disputes through an Alternate Dispute Resolution service? Again, it really depends on the individual dispute. However, a lot of disputes are resolved in favour of the player and if you believe you have a case and it is the operator who has acted against their terms or the law, then you should proceed. As mentioned above, the process can sometimes be very long before a resolution is found. However, depending on your situation and the dispute, it may be worth the wait. If you have escalated the dispute with IBAS or one of the other ADR’s and they have found in favour of the operator, you may wish to take another look over your claim before proceeding with additional steps. One option from this point is to hire a lawyer and take legal action against the operator. Unlike the options above which are free, hiring a lawyer can be extremely expensive should you not win your case. Think carefully before proceeding with this option and seek advice on whether you do actually have a valid claim and why your original claim through the ADR was denied. Can you afford the cost of a case should you not win? If you do decide to proceed with legal action it is a good idea to hire a lawyer who has experience in the gambling industry. You should be able to find some with a Google search but be sure to do research before committing. You may come across a gambling operator who is acting unlawfully and wish to report them. You don’t have to be directly involved with the operator to do this and so instead of going through an ADR, you may wish to report the operator to either the Advertising Standards Authority or the Gambling Commission. Advertising Standard Authority (ASA) – The ASA are here to make sure that operators advertise their service, including incentives such as bonuses and promotions, clearly and fairly. If you have come across an advertisement which you feel has misled you or may mislead others, you can report it to the ASA. All operators are obliged to adhere to advertising standards and although the majority do, occasionally, some don’t. For example, if a promotion is advertised as ‘risk-free’ but can result in losses, then this may be deemed as misleading. Gambling Commission – The UK Gambling Commission is not here to assist with disputes between players and operators. However, they do handle issues regarding operators acting unlawfully. Therefore, if you feel that an operator has broken the law, you can report them to the Gambling Commission. For example, all players are allowed to self-exclude themselves from betting sites. If you have excluded yourself and a bookmaker or casino continues to allow you to gamble, they are breaking the law. To ensure the sites you gamble at adhere to these laws, make sure they are licenced by the UK Gambling Commission. Hopefully, you will never have to raise a dispute with an operator. However, if you do, this article should help you understand the steps required to do so.